Togepi in game: 5,638 Who? Important notice! Pokemon Togepi is a fictional character of humans. Togepi (Japanese: トゲピー Togepy) is a Fairy-type baby Pokémon introduced in Generation II. Prior to Generation VI, it was a Normal-type Pokémon. It evolves into Togetic when leveled up with high friendship, which evolves into Togekiss when exposed to a Shiny Stone. Togepi is able to release poison from the spikes on its head. The anime has shown that it can retract into its shell, which it usually does to sleep. It is able to siphon the positive energy of others, and then release it to those in need of it. It has a very joyful nature. As a result, it is said that it shares its joy with those who take care of it. Because of its disposition, Togepi is seen as a sign of good luck, especially if a Trainer is capable of getting a sleeping Togepi to stand. Although rare in the wild, Togepi can most commonly be found living within the forests. In Attack of the Prehistoric Pokémon, Ash found a Pokémon Egg. It hatched into a Togepi in Who Gets to Keep Togepi?, and since Misty was the first thing the baby Pokémon saw, it believed Misty to be its mother. At the end of A Togepi Mirage!, Princess Sara found the Togepi of Legend, and Misty left her Togepi, which had just evolved to Togetic, in the Mirage Kingdom to guard other Togepi in the Togepi Paradise. Several Togepi appeared in A Togepi Mirage! living in the Togepi Paradise. An unusually bratty female Togepi appeared in Where No Togepi Has Gone Before!. It used its cute qualities to manipulate people so it could cause mischief. A Togepi appeared in Meloetta's Moonlight Serenade. EP050 Togepi Ash's Pokédex Togepi, an Egg Pokémon. Specific information about this Pokémon is still unavailable. 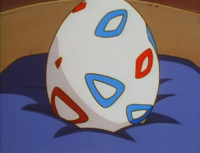 EP050 Togepi Ash's Pokédex Togepi is imprinted with the first image it sees after it hatches, thinking this is its mother. PK01 Togepi Dexter Togepi, the Egg Pokémon. It exhibits a low tolerance for hunger. It is able to communicate this condition in a very effective manner. AG044 Togepi May's Pokédex Togepi, the Spike Ball Pokémon. Togepi is said to exude a relaxing aura that grows stronger when treated nicely. AG045 Togepi May's Pokédex Togepi, the Spike Ball Pokémon. Togepi is filled with an energy that makes people happy. When treated well, Togepi shares this energy with others, but when it comes near a human with an impure heart this energy quickly disappears, leaving Togepi exhausted. DP142 Togepi Dawn's Pokédex Togepi, the Spike Ball Pokémon. Happiness is stored in Togepi's shell, and it shares its happiness with kind-hearted people. Gold was given an Egg hatched by Jasmine's Togetic from Professor Elm that later hatched into a Togepi named Togebo. Togebo's Egg first appeared in Stantler By Me, but Togebo wouldn't officially appear until in Gligar Glide. Due to his abilities as a hatcher, Togebo was born with Gold's trouble-making habits, much to Professor Elm's displeasure. Despite this, Gold wasn't able to truly connect with Togebo until the climax of the HeartGold & SoulSilver chapter, where he evolves into a Togetic and then a Togekiss via Shiny Stone. In The Last Battle XIII another Togepi was one of the Pokémon sent to help the fight in Ilex Forest. In The Golden Boys, Togepi is one of the Pokémon owned by Chris. It was the Egg hatched from Professor Elm's Mystery Egg. Red borrowed Misty's Togepi in The Pokémon Banana League (Part 1). Later on in the chapter, he returns it back. Red also owned a Togepi that hatched in Welcome Back, Clefairy!! and was later traded away for a Tyrogue in Togepi's Determination. 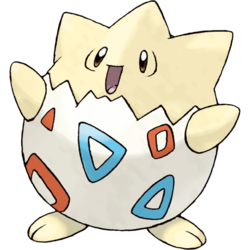 Togepi is a Pokémon in the Magical Pokémon Journey series which first appeared in Eggcellent Togepi. When released from a Poké Ball, Togepi will use Metronome which will trigger Night Shade, Magnitude, Sing, Ice Beam, or Leech Seed. These adorable Spike Ball Pokémon hatch from eggs given out by Professor Elm's assistant. Common superstition holds that their shells are chock-full of happiness and that they become good-luck charms when handled with kindness. It's impossible to predict which ability a Togepi will call upon when it uses its Metronome move, so you'd better be ready! The Melee trophy incorrectly states that Togepi's first appearance was in Pokémon Gold and Silver. 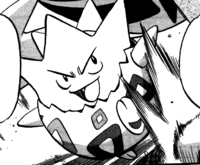 Togepi's first appearance was actually in Hey You, Pikachu!. "A Spike Ball Pokémon. 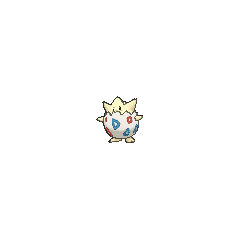 It's said that its shell is filled with joy, and a proverb asserts that if you can get a sleeping Togepi to stand up, you will gain happiness. Togepi can lower its opponent's attack power using Charm. Once it has become friends with its Trainer, Togepi evolves into Togetic." Togepi once again appears as a Poké Ball summon. After being released, it will use Metronome to trigger either Night Shade (causes stage darkness), Leech Seed (plants flower for gradual damage), Hypnosis (puts to sleep), Icy Wind (freezes) or Earthquake (traps in the ground). NA: This Fairy-type Pokémon grows by feeding off the happiness, fun, and kindness of others. It's always filled with joy! In Smash Bros., Togepi uses the unpredictable Metronome move on foes. This move can cause drowsiness, damaging-flower growth, or stage darkness. PAL: A Fairy-type Pokémon that's always sunny side up! It can siphon positive energy from people and spread it across the world. Its Metronome attack can have a wide variety of effects. Maybe it'll plunge the stage into darkness. Maybe it'll plant damage-dealing seeds on fighters' heads. Whatever it does, Togepi will leave fighters scrambling. Togepi appears in the Pokémon mini game Togepi's Great Adventure. Pokémon Mystery Dungeon: Explorers of Time and Explorers of Darkness: Togepi is the leader of Team Glee, along with Politoed and Ledyba. Moves marked with a superscript game abbreviation can only be bred onto Togepi in that game. 51%-100% HP I want to make everyone happy! 26%-50% HP Uh-oh... My HP is down to half. Level up OK! There goes my level! 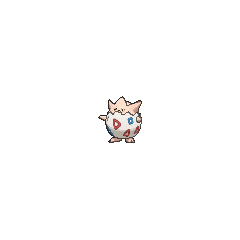 For other sprites and images, please see Togepi images on the Bulbagarden Archives. 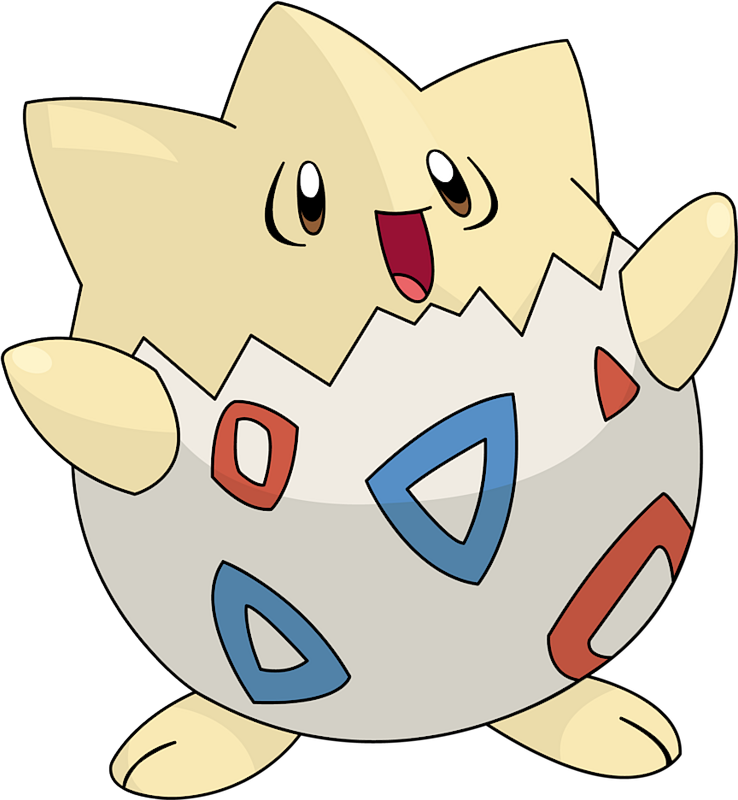 Togepi is the second Generation II Pokémon (after Ho-Oh) to appear in the Kanto series of the anime. It is also the first future generation Pokémon with a known name at the time of its appearance to appear in the anime. 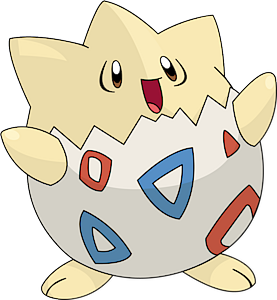 The Togepi that is hatched from the Egg from Mr. Pokémon in HeartGold and SoulSilver will know Extrasensory, a move normally only available as an Egg Move. While baby Pokémon are often revealed before the generation they debut in, Togepi is so far the only baby Pokémon to be revealed before its evolution. On the DVD scene selection screen from Mewtwo Strikes Back, Togepi is listed as Pokémon #152. 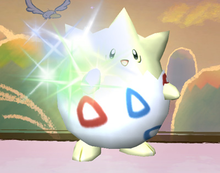 In Pokémon Rumble Blast, when Togepi is attacking, it makes a different cry than its usual one that is heard. When it faints, however, the normal fainting cry it makes in the other games is heard. Togepi appears to be based on the concept of a baby hatchling of any of a number of species of animals. 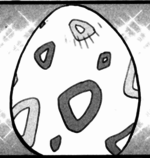 It could also possibly be based on an Egg, with its evolutions based loosely on birds. Togepi and Togepy may be a combination of 刺 toge (spike) and ピヨピヨ piyopiyo (onomatopoeia for a bird chirping). It may also be a corruption of Dokkaebi, usually pronounced tokebi in Japanese, which is a mythical being of Korean folklore. Cantonese Chinese 小刺蛋 Síuchikdáan Means "Little, spiky egg"